Amazon's Choice for "palm sander"
The DEWALT DWE6411K 1/4 Sheet Palm Grip Sander Kit features a 2.3 AMP motor which sands at 14,000 OPM. 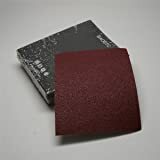 A rubber overmold texture will provide a smooth and comfortable control while sanding. The improved paper clamp features for better paper retention. 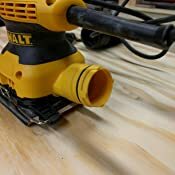 The locking dust-port system allows the user to lock vacuum hose up with the sander. 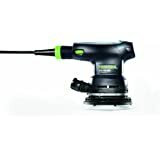 The reduced overall height of the sander allows the user to get closer to their work. 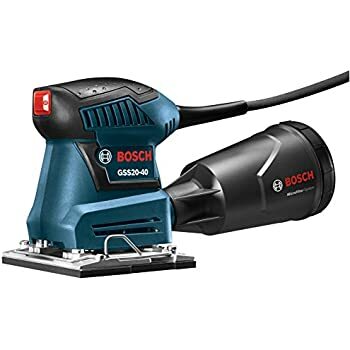 It has a foam pad for flatter sanding plane, a separate counterweight for reduced vibration, and a rubber dust boot over the switch to protect against dust ingestion for longer switch life. 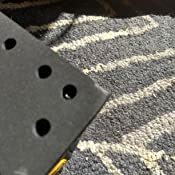 The dust port is designed to fit directly to DWV010 or DWV012 dust collectors - to attach dust port to other vacs with 1 1/4" hoses use DWV9000 universal quick connector. 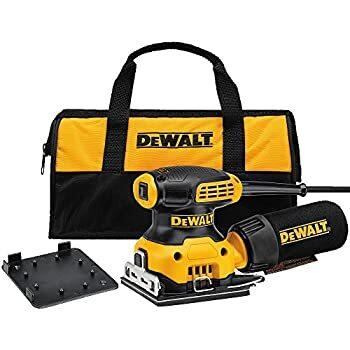 Includes: (1) DWE6411 Sander, Paper Punch, Dust Bag, Carrying Bag. 5.0 out of 5 starsI had to throw away my other two once I got spoiled using this one! 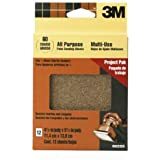 I am a 64 year young female that loves doing home projects. 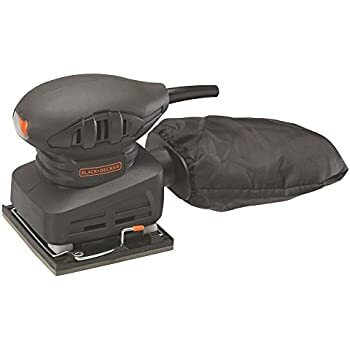 This sander is perfect for my small hands and does not vibrate my hand to pieces when working for extended periods. 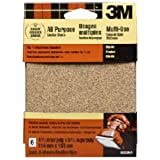 It is easy to change the sandpaper and the on/off switch is easily accessible without fumbling to find it. My biggest challenge will be to convince my husband that it does not belong in his work truck! 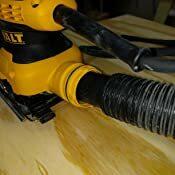 The Dewalt DWE6411K palm sander does a great job as a finish sander - the reason I bought it. Sheet loading and changing is a breeze. Dust collection is superior to any sander I've used to date. The only issue is the proprietary dust port. I would rather hook up a standard small vacuum hose but can't do it. It just flops around in the opening. I now see that the port is of a configuration that you probably can't get an adapter that won't cost an arm and leg or be a kluge of several adapters strung together - can you spell duct tape? 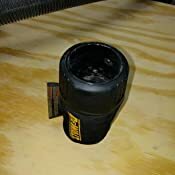 Dewalt did a superior job making this connection useless except for other Dewalt products. It's got locking joints, o-rings and even ball bearings in spring detents - masterfull! I can't figure out how they frenched the dust bag into this thing and am afraid I will break something trying to get it off to see what might be usefull under there... total frustration. A business model that forces customers to buy proprietary products and/or forces them to seek out alternatives to expensive proprietary products is foolish and will ultimately loose me as a customer. 5.0 out of 5 starsGreat value -- works like a charm! First-off in general, I like 1/4 sheet sanders -- they hold the sandpaper better than sanders that rely on velcro. 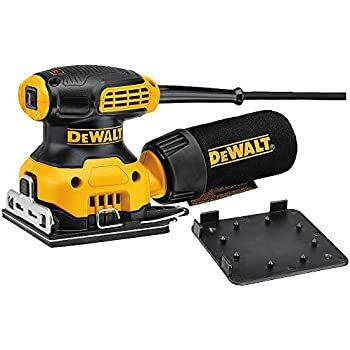 Second, this DeWalt is a honey! It is comfortable to hold, sands well. and the dust-catcher is cloth and works very well. Great design at a great price! Sander works beautifully with one problem…the 3 bearing “O” ring snap on dust bag is very badly designed. 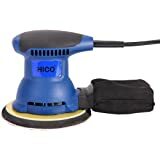 When sanding a vertical surface as the dust bag begins to fill it falls off dropping and bouncing throwing all its contents all over the floor. I am talking about it being only about 1/3 full. Even when empty it is a very loose fit. They need to go back to a twist lock for the connection. I have to use electricians tape to hold the bag on. I may have to drill a hole and thread a wing nut through to keep it on. I would send it back but can't afford the down time. 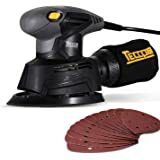 We needed a second palm sander for a kitchen renovation project. 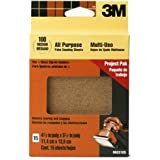 Our original dewalt palm sander used sticking paper, the new one uses clip on which we much prefer. 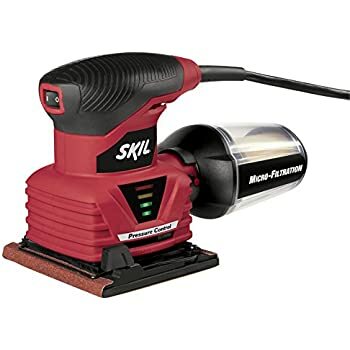 Excellent use so far, but would like an extension adapter to fit into a standard vacuum hose to keep the dust down on the project which is in a kitchen where we live and cook. 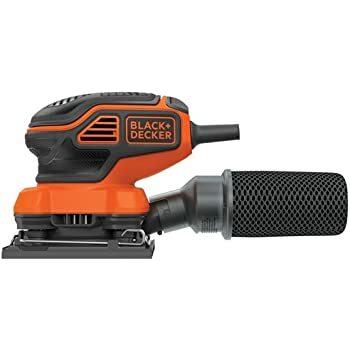 5.0 out of 5 starsRight tool for the Job. With good paper this tool candle handle the job. Few dollars more....... sometimes you do get your money's worth. 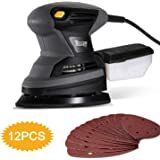 This sander will impress. 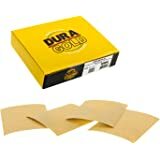 The way it holds paper gurantees no more slipping and twisting of sand paper. 5.0 out of 5 starsSuperior design, super easy to change paper! 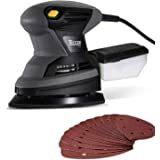 5.0 out of 5 starsThe best sander deal ever.